This year I set a goal to read some professional books that would support my work in education but that live outside of the Science Education realm. I picked Dan Pink’s Drive (see my post from a few months ago) and Made to Stick by Chip and Dan Heath. 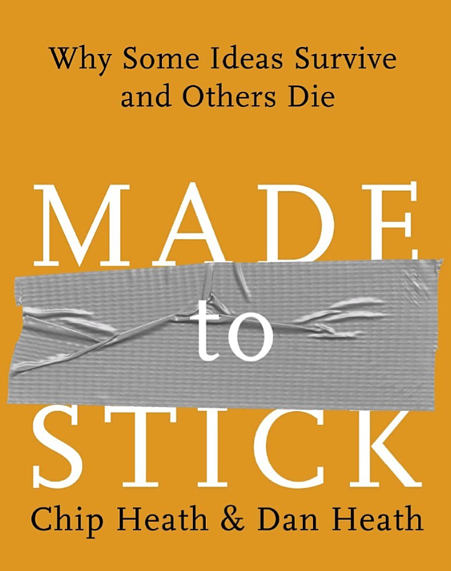 Made to Stick is essentially an elaboration of Malcolm Gladwell’s notion of stickiness from his popular book The Tipping Point. The Heath brothers build on Gladwell’s work by providing brilliantly straight forward examples to illustrate the idea of stickiness. From the story of Southwest Airlines being “THE low-cost airlines” to a Nordstrom employee returning a set of tire chains- the reader begins to vividly see the qualities that determine stickiness of an idea. You need to sign in in order to access these FREEBIES- it’s pretty simple- just your name, email, and zip code. This entry was posted in Science teacher Professional Development. Bookmark the permalink.